1. (1/1) OHIO STATE (8-0, 4-0 Big Ten East) did not play this week. Next: Saturday, Nov. 7 vs. Minnesota, 8 p.m. (ABC). 2. (2/2) BAYLOR (7-0, 4-0 Big 12) did not play this week. Next: Thursday, Nov. 5 at Kansas State, 7:30 p.m. (FOX Sports 1). 3. (5/3) TEXAS CHRISTIAN (8-0, 5-0 Big 12) beat West Virginia Thursday, 40-10. Next: Saturday, Nov. 7 at No. 10 Oklahoma State, 3:30 p.m. (FOX). 4. (4/4) LOUISIANA STATE (7-0, 4-0 SEC West) did not play this week. Next: Saturday, Nov. 7 at No. 7 Alabama, 8 p.m. (CBS). 5. (3/6) CLEMSON (8-0, 5-0 ACC Atlantic) beat North Carolina State Saturday, 56-41. Next: Saturday, Nov. 7 vs. Florida State, 3:30 p.m. (ABC/ESPN/ESPN2). 6. (6/5) MICHIGAN STATE (8-0, 4-0 Big Ten East) did not play this week. Next: Saturday, Nov. 7 at Nebraska, 7 p.m. (ESPN/ESPN2). 7. (7/7) ALABAMA (7-1, 4-1 SEC West) did not play this week. Next: Saturday, Nov. 7 vs. No. 4 Louisiana State, 8 p.m. (CBS). 8. (8/8) STANFORD (7-1, 6-0 Pac-12 North) beat Washington State Saturday, 30-28. Next: Saturday, Nov. 7 at Colorado, 1 p.m. (Pac-12). 9. (9/9) NOTRE DAME (7-1) beat Temple Saturday, 24-20. Next: Saturday, Nov. 7 at Pittsburgh, 12 p.m. (ABC/ESPN/ESPN2). 10. (12/10) OKLAHOMA STATE (8-0, 5-0 Big 12) beat Texas Tech Saturday, 70-53. Next: Saturday, Nov. 7 vs. No. 5 Texas Christian, 3:30 p.m. (FOX). 11. (10/11) IOWA (8-0, 4-0 Big Ten West) beat Maryland Saturday, 31-15. Next: Saturday, Nov. 7 at Indiana, TBD. 12. (11/12) FLORIDA (7-1, 5-1 SEC East) beat Georgia Saturday at Jacksonville, Fla., 27-3. Next: Saturday, Nov. 7 vs. Vanderbilt, 12 p.m. (ESPN/ESPN2/SEC). 13. (13/14) UTAH (7-1, 4-1 Pac-12 South) beat Oregon State Saturday, 27-12. Next: Saturday, Nov. 7 at Washington, 7:30 p.m. (FOX). 14. (14/13) OKLAHOMA (7-1, 4-1 Big 12) beat Kansas Saturday, 62-7. Next: Saturday, Nov. 7 vs. Iowa State, 7 p.m. (ESPN/ESPN2/ESPNU). 15. (17/15) FLORIDA STATE (7-1, 5-1 ACC Atlantic) beat Syracuse Saturday, 45-21. Next: Saturday, Nov. 7 at No. 5 Clemson, 3:30 p.m. (ABC/ESPN/ESPN2). 16. (16/16) MEMPHIS (8-0, 4-0 AAC West) beat Tulane Saturday, 41-13. Next: Saturday, Nov. 7 vs. Navy, TBD. nr (15/17) MICHIGAN (6-2, 3-1 Big Ten East) beat Minnesota Saturday, 29-26. Next: Saturday, Nov. 7 vs. Rutgers, TBD. nr (18/19) HOUSTON (8-0, 4-0 AAC West) beat Vanderbilt Saturday, 34-0. Next: Saturday, Nov. 7 vs. Cincinnati, TBD. nr (19/21) MISSISSIPPI (7-2, 4-1 SEC West) beat Auburn Saturday, 27-19. Next: Saturday, Nov. 7 vs. Arkansas, 3:30 p.m. (CBS). nr (20/20) TOLEDO (7-0, 4-0 MAC West) did not play this week. Next: Tuesday, Nov. 3 vs. Northern Illinois, 8 p.m. (ESPN2). nr (21/22) TEMPLE (7-1, 4-0 AAC East) lost to No. 9 Notre Dame Saturday, 24-20. Next: Friday, Nov. 6 at Southern Methodist, 8 p.m. (ESPN2). nr (22/18) DUKE (6-2, 3-1 ACC Coastal) lost to Miami, Fla., Saturday, 30-27. Next: Saturday, Nov. 7 at North Carolina, TBD (ESPN/ESPN2/ESPNU). 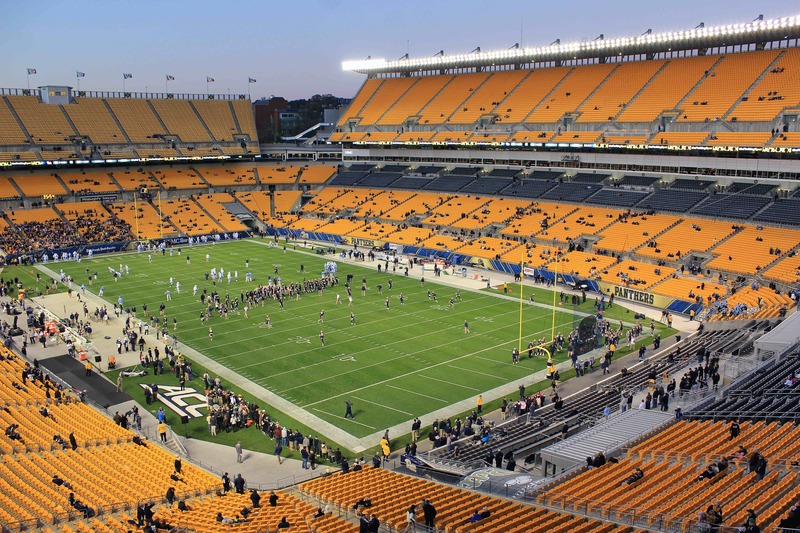 nr (23/24) PITTSBURGH (6-2, 4-1 ACC Coastal) lost to North Carolina Thursday, 26-19. Next: Saturday, Nov. 7 vs. No. 9 Notre Dame, 12 p.m. (ABC/ESPN/ESPN2). nr (24/25) UCLA (6-2, 3-2 Pac-12 South) beat Colorado Saturday, 35-31. Next: Saturday, Nov. 7 at Oregon State, 4:30 p.m. (Pac-12). nr (25/nr) MISSISSIPPI STATE (6-2, 2-2 SEC West) did not play this week. Next: Thursday, Nov. 5 at Missouri, 9 p.m. (ESPN). nr (nr/23) GEORGIA (5-3, 3-3 SEC East) lost to No. 12 Florida Saturday at Jacksonville, Fla., 27-3. Next: Saturday, Nov. 7 vs. Kentucky, 12 p.m. (ESPN/ESPN2/SEC).